We all want it. We work for it. We play for it. Some of us hoard it, others ration it, a few just give it away. But in this day and age, none of us can live with out it. You know what I'm talking about - money. Cash, moolah, dough, benjamins. Take it how you like it - pound, dollar, yen, rubles if you choose. Whatever the symbol in front of the number, it's a necessity of life. But what exactly are those symbols anymore? When was the last time you looked at a pound coin, or a dollar bill? 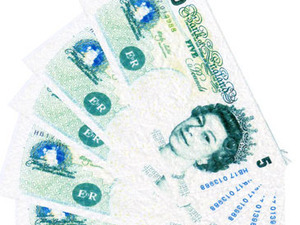 Odds are, pretty recently - but what about the pound note, or the two dollar bill? Some of you may be scratching your heads already - "A two dollar bill? Quid come in paper forms?" Even more important than the denominations of our currency is where that currency is heading. When was the last time you paid for something by just a swipe of a plastic card? How about flashing the little chip on that card in front of a machine? For most of you, that will be as recently as this morning. What changed hands? Is it even money anymore? The digital world has introduced some amazing (and frightening) realities into how we think (or don't think) about money. The technology that houses the fruits of your labour can be pretty astonishing - particularly where it's going. The concept of money is over 10,000 years old. Defined, money is "something generally accepted as a medium of exchange, a measure of value, or a means of payment." A little broad, don't you think? Sadly, history is no less vacuous of substance. Money has been represented by all sorts of things through the years, but it is actually the overarching concept of measured units of exchange - not what we normally think of. You thought that shrapnel in your pocket was money, eh? Technically, that's currency - there is a fine but important difference. Currency is a representation of what is valuable, and money is that value. For instance, you carry 20 quid in currency, but your money is actually that twenty quid, the sum of your bank accounts, the dividends owed on your stock portfolio, and pretty much everything else "liquid" enough for you to sign away easily with a definitive, stamped value. That concept of definitive value is crucial, because it means any currency on any market is money - as long as it has a certain value. For instance, in Ancient Babylon, small iron bars were used as the medium for exchange. Assets or services were valued against that, the iron bars changed hands, and a deal would be complete. Inmates in prison systems often use a similar system with cigarettes, a habit that has been studied by both sociologists and financiers alike. By 2000 BCE, Egypt had started valuing grain harvests with steel ingots. Thus became the concept of store value - one ingot equalled its weight in grain. Over time, the metals themselves became far more value than most of the things they represented, and so coins were developed. 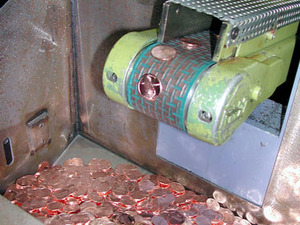 The coin was meant to be a measurement by weight of a certain metal. In time, these came to be stamped with a governmental or authoritative seal certifying their weight. This worked well through much of the medieval period in Europe. The coin was a difficult thing, though - first, it was easy to water the pure metal (silver and gold, usually) down with an alloy in a process known as debasing the currency. Another problem with the coin era involved sheer resources. In some locations, certain metals were more precious (or less precious) than others. Thus, coins could grow to be rather large in size, sometimes to the point of genuine inconvenience. In China, the concept of continually moving heavy metals across the vast countryside became simply infeasible. To prevent this, the economy moved to an entirely baseless currency - paper banknotes that were redeemable for the amount of metal they listed. However, the concept of banknotes was not introduced into Europe until much later (in the mid-1600's) by the Swedish. The presence of copper in the Swedish hills had put such a low value on the metal that a single copper piece could weigh several kilograms to be of any discernible value - certainly not something for your coin purse! Therefore, it became easier to just carry a note stating you had the piece than the piece itself. Paper money and debased coins may seem like where we're at now, but it's taken one more step. If you look on any of your pound notes, you'll see they state that they're redeemable by the British government for that many pounds of sterling silver (hence "pounds sterling"). Of course, the government simply does not have enough gold or silver in its coffers to redeem every last pound note. In fact, it's less than 1% of the way there. Actually, one ounce of silver is worth a little over seven quid. To buy one pound of sterling silver, you'll need to spend 112 pounds sterling. So how did the currency become less valuable than what it represents? It's a great governmental trick called fiat money. Fiat is Latin for "to be done." The secret is that the money is not technically worth anything anymore! Great trick, huh? Fiat money derived from wartime, when governments simply did not have the cash to finance their armed forces. So, they paid in paper money - often much more than they had metal to back. Banking on the fact that not everyone would redeem at once, the governments sat confident that they had just multiplied their reserves and could acquire the shortfall at a later date with the spoils of war - a bold assumption, since most wars were more costly than the goods received. Over time, the value behind each note became only fractions of a pound, despite the printing on the face. It was such a great idea, though, that governments held on to it. The entire concept behind modern economic policy is to control how much of this paper is available at any time - the value is no longer in the money system, but in the currency itself. The use of this policy helps the government manage inflation, interest, employment, and myriad other things - as long as nobody puts a run on the banks. Nowadays, pretty much all governments run on fiat money. That means that there are billions (probably trillions) of dollars, quid, yen, or whatever floating around right now that are only worth anything because some government somewhere says they are. Comforting, isn't it? But why do we care? And what does this have to do with technology?